These super comfortable sporty casual slipons from Clarks have a smooth, relaxed style. Supple, smooth leather upper in a casual slip on style, with contrast colored stitching accents and asymmetrical seam details, contrast colored leather side and front stripe accents, and a hidden elastic center panel. 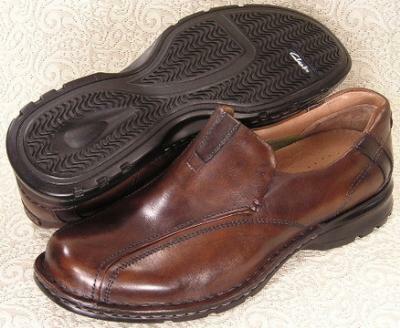 Padded collar, with a soft leather and mesh fabric lining and removable cushioned comfort insole. Very flexible and lightweight outsole with a traction patterned sole.